Twelve months ago Eugene Laverty was cast in the role of support act to star attraction and fellow Northern Ireland short-circuit star Jonathan Rea as the pair attended the opening of the Adelaide Irish Motorcycle Festival in Belfast. One year later, and the young Toomebridge rider took centre stage as he dramatically entered the arena on two wheels in the company of Boyzone member Shane Lynch and former World Superbike champion Neil Hodgson to mark the start of this year's three-day extravaganza at the King's Hall. Laverty's name had dropped off the radar somewhat in 2007 and 2008 as he struggled to pick up points in the world 250cc championship. While Rea deservedly stole the limelight for his headline-grabbing displays at world level, Laverty had to wait for his chance to emerge from the shadow of his fellow Red Bull rookie. A second-place finish behind Cal Crutchlow in last year's World Supersport championship, with four race wins in the process, marked the 24-year-old's return to the big time however. "It was a tough few years on the 250s but I never doubted my own ability to compete at the front and I always knew what I was capable of," said Laverty. "When you know how fast you are, you know that ability doesn't disappear. "The top three was where I wanted to be last season, and while that may have sounded a bit ambitious, I knew after the first race that the bike was good enough to run at the front and that I was up for it. "My first win came in Qatar but the victory at Assen was particularly special as I was not the strongest rider on the day but made such a good pass to win on the last corner. "Winning at the team's own track in Portugal was pleasing too and it was encouraging to put in strong performances at several of the tracks I hadn't ridden at before." Laverty will remain with the Parkalgar Honda team this season and only championship success will suffice this time after falling seven points short of collecting the title last term. "I didn't really expect to come so close in my first season in the series but this time I plan to finish the job off and win it. "I've set the fastest times in the dry and in the wet at the opening test session in Portugal and that was a real encouragement as I struggled in the wet last year. "It's very important to get the settings right and now I don't need to be scared if it rains on Sunday morning - I know I can go out there and win." Laverty took a well-deserved holiday after his efforts last year but has been keeping in shape for the new season by cycling, going to the gym and trials riding. His build-up to the first race of the season at Phillip Island on 28 February has also included a trip to a training centre in Austria, where doctors scientifically assessed his fitness. Accolades have come the way of the former British championship competitor in the form of the Irish Motorcyclist of the Year and Short Circuit Rider of the Year prizes at the Irish Racer Awards in January. "It was really nice to win those awards and it's good to get some recognition for all the hard work I and the team put in last year. "With the likes of Jonny (Rea), Ryan Farquhar and Alastair Seeley all enjoying good seasons I didn't think I'd win it and I was particularly pleased for my personal sponsors after two years of winning nothing." 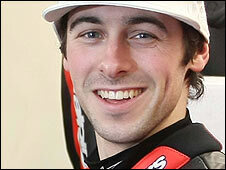 The coming season promises much for Laverty and he is raring to go for another crack at the world crown. "I'm feeling good and am confident with the bike and the team I have around me. "There are plenty of familiar faces in the paddock and while we are there to work first and foremost, it's good to have a laugh with some of the rest of the guys when the racing is over."